Located within Tangalooma Resort, our private Moreton Island villa accommodation opens onto pristine white beaches and unparalleled ocean views. Designed as a home away from home, each 2 story Tangalooma island villa is equipped with all the modern conveniences needed for either a romantic getaway or fun family retreat. A Moreton Island villa holiday will be just what the doctor ordered and it is at a great price too! At the end of a day of exciting activities, whether you want to rustle up a BBQ to enjoy on the waterfront deck or simply stay inside and listen to some music or watch a movie, your Tangalooma island villa has you covered. Sleeping up to 8 people, each Moreton Island villa is equipped with full laundry and cooking facilities and offers direct access to Tangalooma’s beachfront. Simply wander from your doorstep down to the waters edge or amble 10 minutes to the Tangalooma resort activities desk, beach massage hut or restaurants. 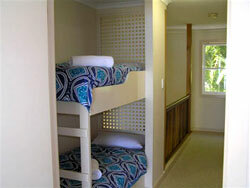 Each Tangalooma island villa has two bedrooms. One bedroom has a queen size bed and balcony, the second bedroom provides two single beds. A double bunk and full bathroom. Each Moreton Island villa has a self-contained kitchen, TV area, DVD, lounge, microwave, additional toilet, laundry, washing machine, bunk bed for sleeping another two persons, exterior deck with furniture and BBQ. Each Tangalooma island villa will allow you to savour luxurious sleep-ins and awake to the sound of the waves on your doorstep. Enjoy late breakfasts al fresco overlooking Moreton’s breathtaking waterways and don't neglect romantic gourmet dinners at the Tangalooma resort restaurants. 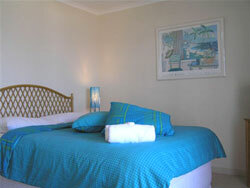 Whatever your pleasure, you'll find a Tangalooma island villa the ideal break away.